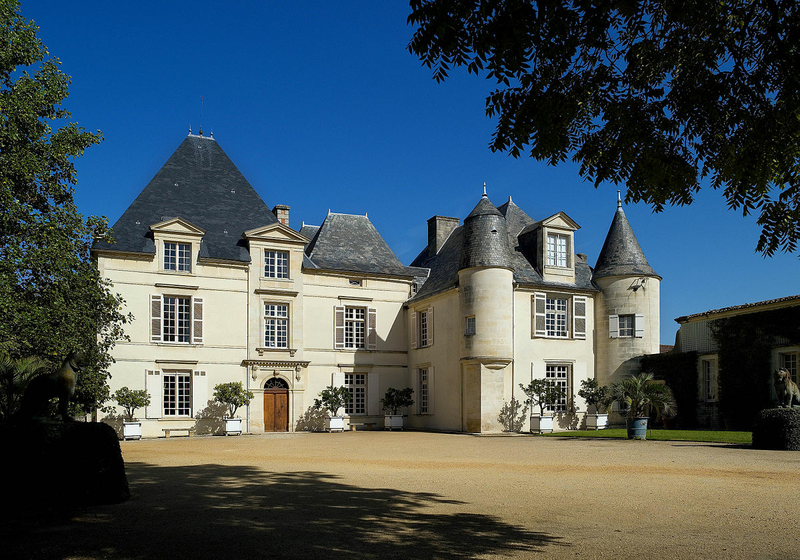 Château Haut-Brion, Pessac Cedex is not a member of Wein‑Plus yet. By creating Château Haut-Brion saved filter, you will see relevant matches on your home screen. The famous winery is located in the municipality of Pessac (suburb of Bordeaux) in the area Pessac-Léognan in Graves (Bordeaux). The origin goes back to Arnaud I. Pontac, who made a fortune from 1496 as an exporter of wine and vines from the Bordeaux. His son Jean de Pontac (1488-1589) built in 1550 the north wing of the Château. In 1525 he married Jeanne de Bellon, who brought as a dowry a part of the winery Haut-Brion in the marriage. His only sister, Marie, married an Arnaud de Lestonnac, who in 1540 was neighboring Château La Mission Haut-Brion founded. Of the three marriages of Jean Pontac (the last he entered at the age of 76), fifteen children were born. For the next two generations of Pontac, there is nothing worth mentioning about viticulture. By Arnaud III. de Pontac (1599-1682), the wines of Haut-Brion also became known in England. He recognized the importance of the English market and is considered the founder of the Château wines, because he was the first in Bordeaux, a wine under the name of the winery marketed as "Haut-Brion". Another marketing pioneering act was selling the second qualities from his other possessions under the surname "Pontac", which was, so to speak, the birth of many today Châteaux usual second wine, He also introduces new winemaking techniques. To suspect is that he is having much longer ones worked, because the Haut Brion wines were then described as much darker than other Bordeaux wines. He also introduced the expansion in new oak barrels. The famous Samuel Pepys (1633-1703) described the wine in his diary in 1663: "I have just tasted a French wine called Ho-Bryan (sic), which has the best and most extraordinary flavor I have ever encountered." He was also very popular at the English court, in the basement records of Charles II (1630-1685) are served to the royal guests "169 bottles of Hobriono" mentioned. Arnaud Pontac sent in 1666 his son François Auguste Pontac (1636-1694) to London, who founded the later famous tavern "Pontack's Head" behind the Old Bailey (Criminal Court) on his behalf. The target audience was the affluent, aristocratic society, which was there to enjoy the exquisite wines of the Château Haut-Brion for exquisite meals. The restaurant, which was exceptional at the time, was a resounding success and has been in operation for over 100 years. After the death of François-Auguste, his sister Thérèse inherited two thirds of the winery. The remaining third became the property of Louis-Arnaud Lecomte, the nephew of François-Auguste. Thérèse also inherited that Château de Pez in Saint-Estephe. In 1654 she married Jean-Denis d'Aulède de Lestonnac, the owner of Château Margaux was. Her son Marquis François-Delphin d'Aulède de Lestonnac (+1746) managed Margaux and Haut-Brion at the same time. Heiress was his sister Catherine d'Aulède de Lestonnac, since 1688 widow of Count François-Joseph de Fumel. Her great-nephew Joseph de Fumel (1720-1794) carried out extensive beautification work on the château and added an orangery, a factory building and a large park. In the turmoil of the French Revolution, the property was expropriated and Joseph de Fumel lost in 1794 in addition to his possession "because of international activities" and his head under the guillotine. In 1801 the estate was built by statesman Charles Maurice Talleyrand (1754-1838), the Foreign Minister Napoleon (1769-1821). He used the prestigious property for diplomatic purposes, but sold it again after three years. In the period 1804-1836 it belonged to a banker and later a wine merchant. Finally, it was in 1836 in a public sale in the possession of the Paris banker Joseph -Eugène Larrieu (1777-1856). The new owner played an important role in the development as he enlarged and consolidated the winery. He acquired in 1841 that third, which had been separated during the inheritance in 1694. He is mainly attributed the merit that it is at the Bordeaux Classification 1855 was classified as "Premier Cru". It then remained until 1923 in the possession of the Larrieu family, then belonged to a bank and then a André Gibert until it finally bought in 1935 by US investment banker Clarence Dillon (1882-1979) for 2.3 million francs, because he got this wine so appreciated. His son Clarence Douglas Dillon (1909-2003) later acquired other wineries. From 1979, the family empire was Domaine Clarence Dillon directed by his daughter Joan Dillon, a Duchesse de Mouchy. Her successor is since 2001, her son Prince Robert of Luxembourg. The winery is managed professionally by the Delmas family, currently by Jean-Philippe Delmas in the third generation. In the 1960s, Château Haut-Brion was the first Bordeaux vineyard to use stainless steel fermentation tanks. They put a lot of emphasis on the selection and propagation of the best vines. It is set on variety, in the vine are about 400 different clones. The vineyards cover a total of 46 hectares, the vines are on average 40 years old. The soil consists of a nine meter deep gravel base, which gives the wine its unmistakable character. Of these is the vast majority, namely 43 hectares of red wines Cabernet Sauvignon (45%), Merlot (37%) and Cabernet Franc (18%) planted. The red wine is fermented quickly and relatively warm in stainless steel according to the type of house. He is then aged for 18 to 24 months in 100% new oak barrels. The extremely long-lasting wine can be stored for many decades. The English wine author Hugh Johnson describes the 1899 Impérial with: "The most fascinating Bordeaux that has ever hit my tongue" . Unmistakable is also the bottle shape of the house; compared to a normal one Bordeaux bottle the bottles are conical (slightly thicker towards the top). The vintage 1970 was legendary Paris Wine Tasting In 1976. The distinctive skin Brion style is characterized by "optimal elegance and harmony with excellent fruity and earthy Aromas "described. Despite the longevity, the wine is ready for consumption relatively early. The tannins disappear after a few years faster than other Bordeaux wines and it formed a creamy note with notes of plums, currants and tobacco, The second wine is called "Bahans Château Haut-Brion". Three hectares are with the white wine varieties Sémillon (two-thirds) and Sauvignon Blanc planted. The long-lasting white wine also matures in 100% new oak barrels.